Inverted Row (Bodyweight Row) is a bodyweight exercise that primarily targets the lats, rear shoulders with secondary emphasis on the biceps and forearms. 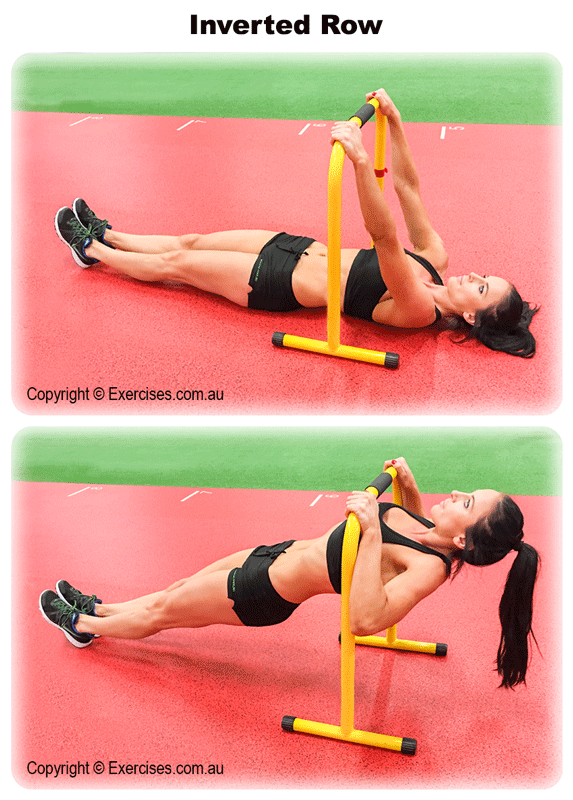 Inverted Row is a good alternative to those who have a difficult time with pull-ups. It is also safer because the angle removes compression forces on the rotator cuff. You can do Inverted Row as a finisher to a back or shoulder workout. Set a bar at a height where you can feel a stretch on the lats and rear shoulders at the starting or fully extended position. Place a foam pad on the center of the bar. Lie on the floor and take a wider than shoulder width overhand grip on the bar. The bar must be in line with your wrist, elbows and shoulders. Keep your feet straightened out on the floor. Pull your shoulders slightly back, chest out and keep an arch on your lower back. Hips should be off the floor. Contract your lats and pull yourself up to the bar. Think of pulling your elbows back. Lead with your upper chest, let it touch the foam pad and hold the position for a count of “one”. Pull your scapulae back, squeeze your lats and rear shoulders. Do not lift your hips up. Resist the weight as you bring your body back to starting position. The purpose of the foam pad is to make sure you reach the correct height without rotating your wrist which places unwanted pressure on the wrists and elbows. When pulling up make sure your elbows are moving toward your lats and not flaring out. Maintain a slight bend in your elbows at the start position.